Back in the early Eighties, when Founding Benefactor and first President of the Branford Community Foundation H. Allen Carroll was looking for generous Branford citizens to help get the new organization off the ground, he approached Barbara and Bill Lyons. They responded by making the single largest contribution the Branford Community Foundation received in its first quarter century of existence. Their gift, in the form of equities, was sold and became the William C. and Barbara R. Lyons Fund and has grown to become the largest named fund currently administered by the Foundation, over $130,000.00. The Lyons’ desired to have their fund help the neediest in Branford, therefore, every year the Branford Community Foundation makes a grant to the Branford Food Council to help that wonderful organization meet its ever-growing demand. Bill, retired Vice President of the Bilco Company, a family business, and Barbara, born and raised in Branford, settled in Branford upon their marriage in 1953. They raised their six children here and are now proud grandparents to eight grandchildren. Barbara has always been active in the community, including the Branford Garden Club, Friends of the Blackstone Library, and the Branford Historical Society. She recently completed a term as Trustee of St. Therese’s Church. Barbara and Bill, along with other members of the extended Lyons family, have and continue to be major supporters of the St. Raphael’s Foundation. The Branford Community Foundation is honored to partner with these two generous and civic-minded individuals to work for the betterment of the town of Branford and its citizens. 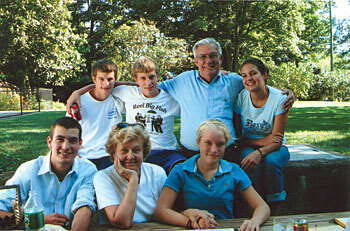 Pictured above are Barbara and Bill Lyons enjoying a beautiful day with several of their grandchildren.